Grandma's greatest gifts are her grandkids, and this personalized Christmas shirt says it all. 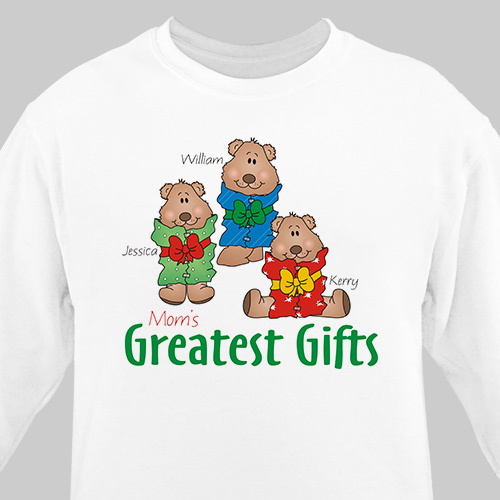 Our custom Greatest Gifts sweatshirt can be personalized with any title - like Nana or Mom or Dad - and up to 30 names of precious little bears. This custom Christmas sweatshirt is available in three colors and adult sizes S-4XL, and it's machine washable. Good quality sweatshirt with great graphic design. I would've given this product a 5 stars but the sizes run big in my opinion. I got this for my dad who is a true size large and it fit him like it was an extra large, hopefully it'll shrink a little in the wash.